C'SEED and Porsche Design have just unveiled the world's largest TV comfortably beating the Samsung S9 UHD TV which was shown off at CES. 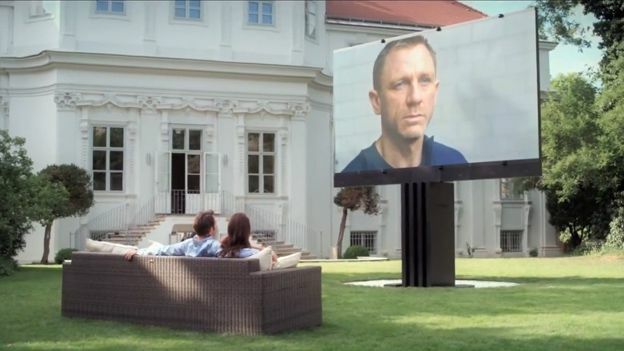 This 201-inch behemoth is an outdoor LED TV that boasts a range of premium features and comes with a price tag to match of over £400,000. The 16:9 HD LED TV is custom installed into your garden where it safely hides underground, at the touch of a button the TV rises out of the ground and unfolds to reveal a display that boasts 4.4-trillion colours and is fully daylight compatible. If that wasn't enough the TV is waterproof and boasts three 700W Subwoofers giving you a grand total of 2,100W of audio power, more than enough for your average garden. Naturally you'll want it to be connected to everything in the house and this comes courtesy of a custom-fitted server which uses fibre optic cables to stream all your content from your Sky Box, computer, camcorder, smartphone and gaming console giving you the chance to play Xbox 360 titles on a 201-inch screen. Finally the C'SEED comes packed with sensors and new technology that keep it protected from the elements and unwanted users including a wind sensor and fingerprint reader on the remote control granting only those who have permission access.